I like to keep in mind that everybody in that audience is just glad it’s not them… Or if it was in school, everybody was nervous and almost no one cared- besides when it was their turn. The first minute or two is downright agony, but once you get passed that, it’s all gravy. Very true. Most people would rather have a fork jammed in their eye, than have to give a presentation. 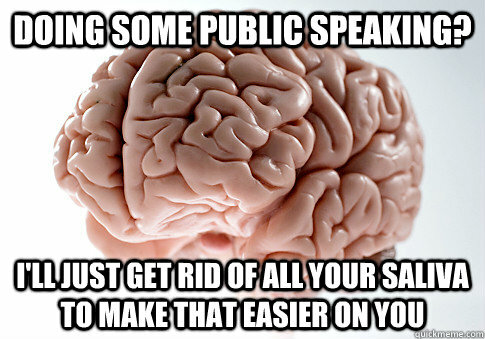 This helps me too and it’s something I tell people who are nervous about public speaking. Giving presentations used to horrify me, but as you point out, over time it becomes easier. The heart races less; the voice shakes less. I’ve found the key is preparation, which, of course, involves a lot of time. 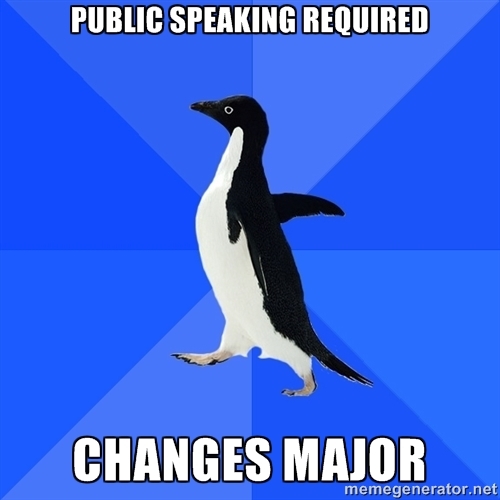 I’ll run through a presentation many times before I actually give it. On the other hand, I’ve never had to give one more than an hour long. Four hours? Yikes. After surviving that, your agent pitch will seem easy! Good luck with it, by the way. Very exciting! Yes – preparation is very important. I’m way less nervous when discussing topics I know front and back, so I try to begin with these. I practice a lot too. When I was preparing for my first of these trainings, I even taped pictures of people’s faces from magazines on the walls to practice making eye contact! Every part of this post was fantastic. I know you lead great, informative talks – glad to hear the consulting gigs are picking up. Which writer’s conference are you going to? Anne! I’ve missed you! Yes, things are picking up, but it still comes in waves. I used to hate talking in front of people. As a kid I had to do a couple of assemblies in front of my whole school. The first one was at primary school when I was about 8 or 9 reading a poem about Henry VIII and his Six Wives, I was picked by my class as being the best at reading aloud. I don’t think I looked over the book once whilst reading it out. I was petrified! Then the second one was in my secondary school when I was about 13 – had to read something out about King Canute casting back the waves but I was losing my voice so kept croaking and coughing and apologising, turning a very vivid shade of beetroot. Then the third one was when I was about the same age as part of my German class doing something about Europe, I was the German footballer Jurgen Klinsmann and had to jump off the stage, run down the middle of the hall and do a power slide through a load of boxes meant to signify the Berlin Wall. (I might add this was actually my idea…) I whacked my arm on a load of chairs as I went, got up and waltzed out of the hall as if I did that sort of thing every day. Most people thought I was a total loon. It was only as an adult through work that I began to feel a bit more confident about talking in front of others, contributing in meetings that sort of thing. Then while working at one place my best friend Dom and I started to do workshops about researching family trees, so that meant talking to a bunch of people who were there to actually listen to me speak. The first few minutes I was always a bit shaky and nervous but after a while they were a breeze and I loved it. Yes, I had very similar experiences (well, except for the power slide). 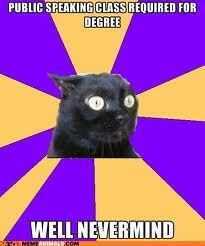 My nerves started to appear in middle school and didn’t really start to improve until my early thirties. It is a different experience when people are actually coming to hear you speak, instead of a group of kids forced to listen to your presentation or your reading of a poem about Henry VIII. It adds an additional layer of pressure – not only do I have to perform, but I don’t want to disappoint them. Congrats on the poetry competition. Reading something that is so personal would be scary too. And I can’t imagine having too much saliva. I’m always sucking on mints and drinking gallons of water to keep my mouth moist! My Dad had me read in church when I was a kid, so I’d learn to get over fear of this at an early age. Practice does make perfect. The biggest trick is to appear confident. This is literally 90% of the battle. If you exude quiet confidence, your audience picks up on the cues and accepts what you’re telling them. I totally agree with appearing confident. I tell myself that over and over again and it really does work. No one else realizes just how nervous you are. I also try to sound really interested in what I’m saying, I think it makes the audience feel more interested and engaged. I feel absolutely terrified of speaking in front of a group because I’m always scared that people will think I don’t know what I’m talking about. So each time I have to give a presentation, 5 minutes before I have to go up there, my hands would tremble worse than some 90-year-old trying to make it from the kitchen to the living room. In the end, I think it’s just a matter of practice and making the audience think you’re confident about the information you’re presenting. Yes, that has been part of my battle with these presentations: people are paying to hear me speak – what if I disappoint them, what if I mess up and get my facts wrong, what if they don’t learn anything? And you’re right, confidence is a huge factor: eye contact, strong voice, taking command of the room. It all helps. And after awhile, I think those little shots of adrenaline actually help make the presentation better. I feel more on top of my game in the beginning when I’m a little nervous, versus the end of the presentation when I’m tired and no longer nervous. I can’t imagine me ever being comfortable talking before a large group. To this day, when I get called for Jury Duty and they just go through the potential jurors asking a few simple questions, I feel as if my heart will beat through my eardrums and my voice sounds all shaky. I hate being this afraid to talk out loud. Good for you overcoming this. 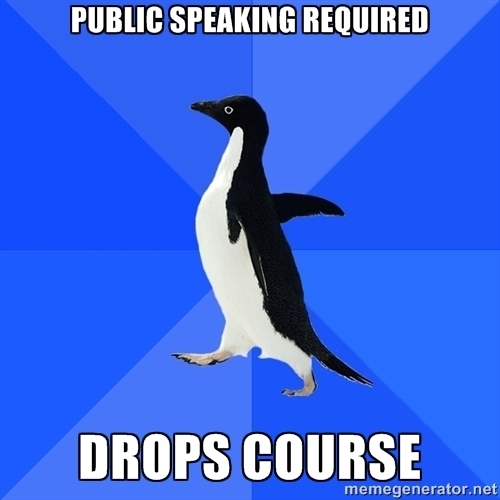 I was dreadfully afraid of public speaking in school. Horribly afraid. I still remember those kids who were more scared than I was, when it came time to speech day… they had tape recorded their speeches and sat with their heads tucked as the tape recorder played. I felt lousy about it, still do. I forced myself to speak in front of people eventually, and the more I did it, the more comfortable it become, and honestly, now I crave it. I want people watching me. Yes, I am an attention whore (I’m sure my blog proves that). But I’m okay with it. I like it this way. You were allowed to tape record your speeches? I know. It’s so obvious you’re a glutton for attention. It’s embarrassing, really. I almost felt bad for Art because you were clearly monopolizing his “comment here” post. In public school, the really shy kids were. It was so hard to watch and hear. Yes, I’m a total attention whore. Pay attention to me, everybody! I love that comment thread, I saw Art had a new game for us there… will have to go there. Writing conference, correct? Which one? Cool. Have a great time and hope you make some good connections. Just got back from the conference yesterday – it was awesome! It really was!! I’m glad you wrote this just in time for our read and critique. I tried to keep my voice from shaking and my heart from pounding too noisily…Not sure I managed. What a great experience though! That’s funny. I was thinking, ‘now I have to be on Facebook. He’s going to be looking for me’. Personal and a writing one…it’s from a long time ago…when I was too scared to admit I write. 🙂 Wonder if I can combine the two? Post about it! I just bugged Linsday about that. I don’t know what you’re so worried about, it’s just like blogging…but to a live audience…without the capacity to edit…or the safety of the internet…with the added pressure of time constraints…and…ok, ok. It’s not just like blogging; good for you to have the courage. Thanks! It really has gotten easier and when it came down to public speaking or no money to pay the bills, I had to choose the public speaking. One thing I appreciate about the church I belong to is that you get comfortable with public speaking at an early age – even the four year olds give talks (with lots of help) in their Sunday school classes. Unfortunately that didn’t help me since I didn’t join until I was 18. We don’t have a paid clergy, so every one takes turns giving inspirational talks and teaching classes. While I thought I’d keel over and die the first few times, I actually kind of enjoy it now. Nothing like being forced out of your comfort zone. It sounds like you have a nice little business going there. I totally agree about getting out of your comfort zone. I think that’s been one of the best things about being self employed. The business waxes and wanes and sometimes it’s more work than I anticipated, but I’ve pushed myself and grown in ways that wouldn’t have happened had I stayed at my 9 to 5 job. Very true. That’s something I’ve realized I need to work on. Now that I’ve moved past being terrified, how can I improve my performance to make the presentation even better? My tuppenceworth…. I don’t know if you can access this in your job – it’s an old paper, but a good one – http://bit.ly/1iiTdNe Also, if you are doing a long presentation, look at it in terms of 30 to 50 min segments. Break it up with something like youtube clips or tedtalks, but not long ones, and don’t overdo it. Even a Dilbert or something can bookend a section. If you can find an artefact – pass it around – people love handling stuff. If you have to hand out material, take the time to discuss it as you pass it around – nothing critical until they all have it in front of them. And enjoy yourself! If you do, mostly they will. Ha ha! So true. I can understand that a lot of our fears go back to cave man days (fight or flight, being chased by mammoths etc) but I don’t understand why public speaking creates such a physical fear! 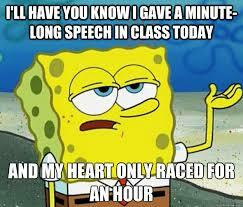 I applaud you for being able to speak for four hours!